As a sportsbook banking option, credit cards can be an excellent choice as they are supported everywhere and can allow for very large single transactions. Visa in particular works with almost any currency you can think of. You should be advised only to use credit cards for such transactions if you have the cash readily available to pay your impending balance immediately so as to avoid the associated interest charges. Credit cards and debit cards are likely the banking method that allows you to get started fastest, as you’ve likely already got at least one of these available to you and the deposit transaction itself is instantaneous. Most people for example do not register an e-wallet account until they are ready to also start betting online. While that process of e-wallet registration is quick, it is certainly fastest to just enter your debit card or credit numbers and details. Further on the on the positive side with regard to debit and credit cards, they are not generally subject to restrictions or limitations for initial free bet promotions. Some free bet promotions restrict the use of e-wallets for eligibility. You won’t have this issue when your initial deposit it with credit or debit card. Finally on the positive side, if you use a debit card, you will be using your own funds to play and thus won’t incur any significant fees or interest charges. On the side of things to consider: credit cards. It is important to understand that oftentimes, transactions to a credit card for the purposes of betting or gambling are not treated as purchases, but rather as a cash advances. This means that interest may accrue from the moment of the transaction as opposed to the payment deadline on your subsequent card statement or invoice. Or, depending on your provider, you may incur a special fee for this kind of cash transfer transaction as opposed to a traditional purchase in lieu of the above interest schedule or in addition to it. Thus, it is always best to investigate how your particular credit card provider will treat a transaction with an online sportsbook. You should enjoy your betting experience as much as possible, but should also make informed and responsible choices. Note that from the UK, you can only withdraw funds to Visa Card. MasterCards may deposit only. Only wager what you can afford. 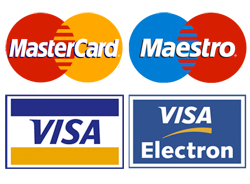 Credit and Debit Cards are accepted at all the top football betting sites. You can get started very quickly, but beware of credit card fees where applicable.